For those of us who like to play with art materials and explore new avenues without boundaries, mixed media is wonderful. 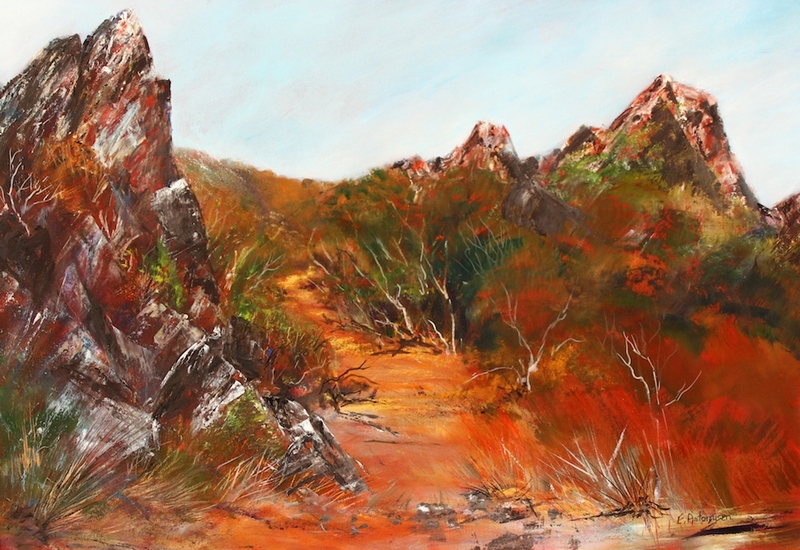 Above, “Wilderness Track” is a large work painted in acrylic which was applied from very dilute, like watercolour, to thick impasto painted on with a palette knife. Pencils, oil pastel, soft pastel sumi ink and white pigment ink were all applied at various stages. The ground was an Art Spectrum Colorfix paper in a rich terracotta colour, hence the warm overall glow. 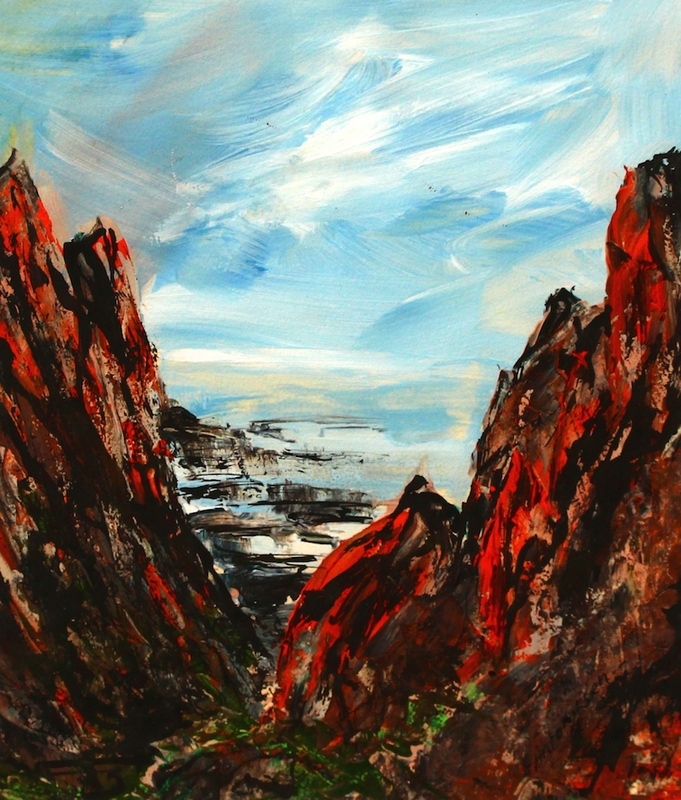 The inspiration was a coastal walking track on Tasmania.s Tarkine coast. Walking between the towering angular rocks is amazing. On one of the days over Easter 2015 when I was, with about 70 other artists,on Tasmania’s Tarkine Coast, I was taken on a 4WD expedition down past the sealed tracks. To get to such remote and wild places was unforgettable. It is the geology of the area that continually attracts me…. and of course the ever changing ocean and sky.This work is also painted on Colorfix paper, this time in a warm grey. After working with very wet acrylic paints and a spray bottle of water, I used the side of the wet solid Sumi ink stick and a little liquid ink applied with a rigger brush to keep the stokes fluid and loose. Finally linear marks with charcoal and a touch of pastel completed the textural effects for which I was aiming. This third painting was about the intensity of the colour of the red lichen so it was started with oil paint stick and oil pastel on a very rough Fabriano watercolour paper. 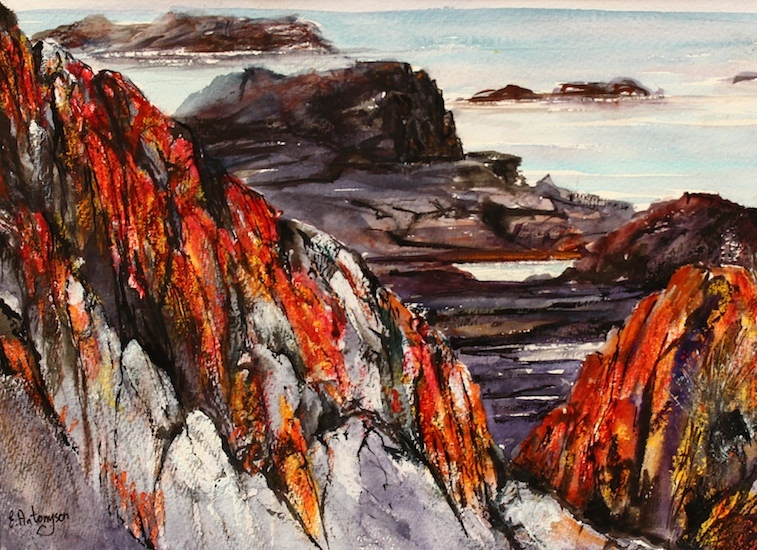 Light watercolour washes were applied to the sky and sea as a foil for the heavy texture of the rocks. Watercolour was also applied as glazes over the rocks, with the previously applied oil based media acting as a resist, thus retaining the intense colour. Finally Sumi ink was added in three ways….. dragging the broad end of the wet stick across the paper, drawing some crevice lines directly with the wet stick, applying the ink using 2 brushes to direct flow for tonal areas, and varied ways of applying with a rigger brush. Wonderful textures resulted. This small, quick work was completed primarily with acrylic applied with a palette knife and fingers. Final touches were added with Sumi ink and a little oil pastel. It captures the drama and inspiring natural forms of this threatened wilderness area. 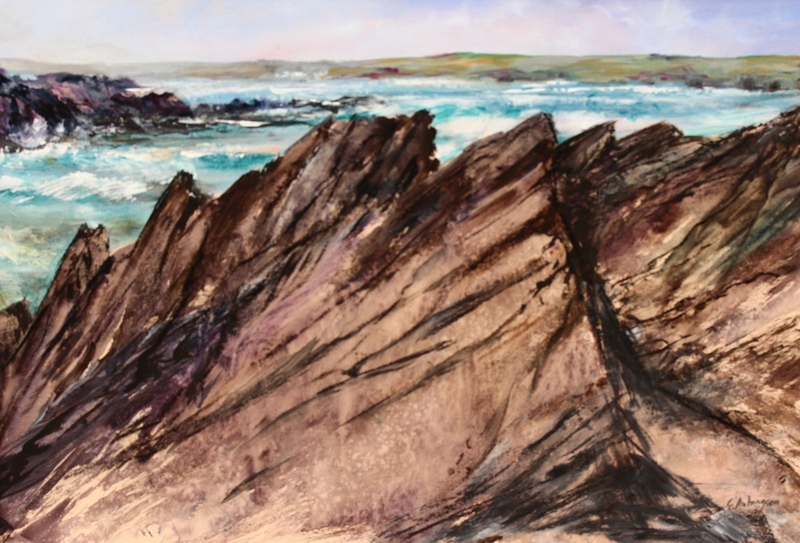 This entry was posted in All things Coastal, art, painting, seascapes and tagged acrylics, art fun, art play, beach, beach things, coast, colour, Contemporary art, creative watercolour, geology in art, mixed media, nature, raw, Tarkine Coast, Tarkine Wilderness, texture, wilderness. Ev, enjoyable, informative … and inspiring! Sumo stick sounds interesting, shall enquire locally. And i love the art work. would love to call in one day en route QTown, will be in touch. Hi Merril. It would be lovely to see you sometime. If you can’t find Sumi ink sticks I have a couple for sale here (about $6) and the ink grinding stone which is used to make liquid ink but sometimes I just make marks directly with the solid ink stick (after wetting). In my art materials retail I like to stock more unusual or harder to get items (like silk paints and Sumi e supplies). Thanks so much for the positive feedback. Loving exploring/playing. I can see a need to start spending on different materials. I usually phone Artery. Sometime i will ask you where you get some more specialised things . Hope that’s OK?